Feel real inadequate to not know the ideal chemistry of solder. Does the flux have to be washed off a board like the old Kester organic flux solder (which corrodes if you don't wash it)? Or can you use it for everything, washable and non-washable parts alike? Somebody commented on the .020" sample that you should clean it with a wet Q-Tip or similar because it is corrosive. I had trouble using the leaded solder with my butane torch and found out I should be using flux with that. Since SparkFun can't sell flux right now, I got this solder and it works perfectly. As a novice, finding something that just works is awesome. What am I doing wrong with this solder? I used it to solder a header onto a breakout board. The solder did not flow well, and it seemed to frost a lot. I have no problems with the 63/37 mix. 63/37 is a leaded solder - this is not.. you'll want a higher temperature. 380Â°C worked well for me with the sample I got. My iron has nothing to tell me the temperature, neither does it have a precise control. Maybe someday I can get a better station. Thanks. Is it just me, or does this solder smell sweet when it burns? LOL, I'm trying my best to avoid its burning vapor, but DAMN it smells weird! I feel Like I must ask, What differentiates this solder from regular solder? What, in the opinion of Spark-fun, makes this superior? I suppose I may be a solder Philistine because up until I read the description of this item I assumed one solder was just as good as another solder. By my calculations, the mass of this 20-foot sample is about 23.6g. This is taking the densities of the primary constituents, tin and silver, to be about 7365 kg/m^3 and 10490kg/m^3 respectively. By comparison, the 1/4lb mini-spool of this blend is about 131.5g of solder and the 1lb spool accounts for 454g. You can compute the value-for-money quotients on your own. Surprisingly, the only good and cheap solder (2% Ag) that I could find was at the local Radio Shack. What's the melting point of this solder? Hmm pretty toxic. I gonna buy some!!! This flows better than most leadless solder. 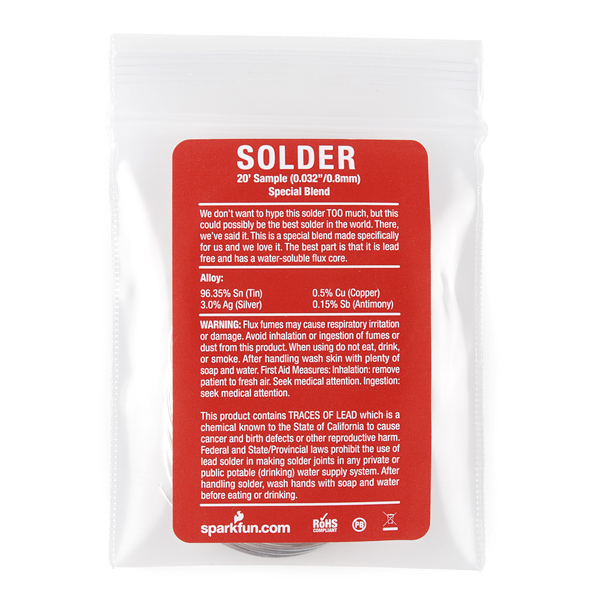 I ordered this thinking, "Hmm, Sparkfun seems to recommend this stuff for lead-free soldering, why don't I give it a try?". 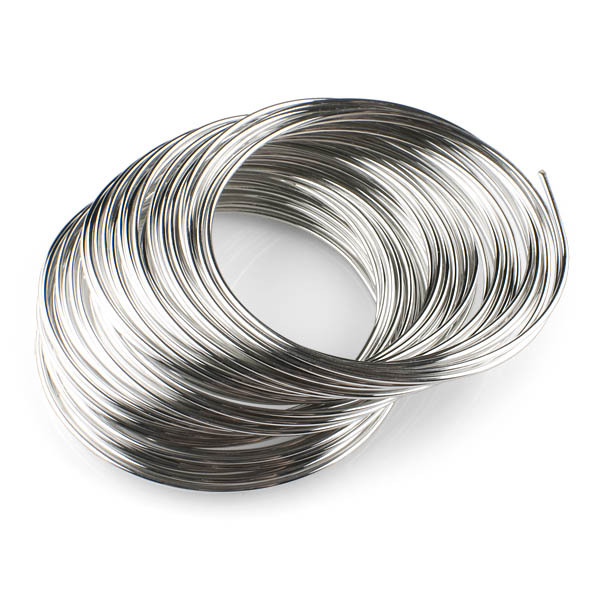 It was great of them to offer a sample while it lasted, because then people could give this solder a try for a lower price rather than buy the entire spool for $25. At the time I didn't have that kind of money. Compared to the other lead-free Sparkfun solder (Sn99e alloy), it was OK. The solder itself seemed to flow well and leave shinier joints than regular SAC305, but I tended to get charred black bits on the iron tip. I later learned that this is the burned flux. As I didn't have the luxury of working in ventilated areas, I got to experience the smell of the flux vapor, and while it's not the most pleasant thing in the world, it smelled better than the Sn99e solder and cigarette smoke. The one annoying thing I found about it was that it was covered in a sticky residue (as I later ascertained, the flux). It was like working with solder and sugar syrup at the same time for some reason. Fast forward a few years and now that I've learned more about soldering and fluxes, I feel that I should inform people to be careful with this stuff and all water-soluble fluxes in general. While it's convenient to have a flux that you can simply clean off with warm/hot water (and an electronics-safe soap if you've got it), water-soluble fluxes are organic, and they tend to be quite aggressive. Looking at Indium's information on the flux used in this solder (CW-301), its IPC rating is ORH1. Translated, that means, "Organic, high activity, some halides." High activity means that you can use this on brass/copper/tin surfaces that aren't perfectly clean or in circuits where some of the pads are a bit corroded, but this is by no means a "no-clean" flux-- you have to clean this stuff up in a production environment, or you will be very sorry you didn't. Additionally, in situations where the surfaces of your components/boards are already clean to begin with, this is probably overkill and can even eat into copper traces if left on the board. In practice, I don't recall running into a trace failure or such because I didn't clean it off, but because of the aggressive nature of water-soluble fluxes, I would rather be safe than sorry. The presence of halides makes me a bit wary of using this without proper ventilation or filtering of the flux vapors, though to be honest, I don't recall my throat drying out after using this stuff. It would be cool if Indium/Sparkfun offered this with an RMA flux (CW-802 or CW-807) that isn't as aggressive (doesn't have to be no-clean, I personally like to clean off the board because most fluxes are sticky afterward), or just the alloy itself, since the added antimony appears to improve the appearance of the joints and improve visual inspections. Whatever flux can be added beforehand (I'm liking the Amtech series personally), and as long as the surfaces aren't too corroded, most good fluxes can clean them for most solders.